These filters absorb Ultra Violet (UV) light. Film is more sensitive to Ultra Violet light than our eyes. This often shows up as a haze or a bluish cast, especially when shot from high altitudes and from long distances, particularly over water. 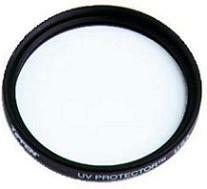 UV filters also help protect your lens from dust, moisture, fingerprints, scratches and damage from cleaning. Since they absorb no normal light and have no effect on color or contrast, they can be kept on your lens at all times.